AirAsia's Tony Fernandes with Airbus COO-customers John Leahy, CEO Tom Enders, and EADS CEO Louis Gallois. 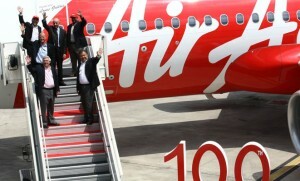 Low cost airline AirAsia took delivery of its 100th A320 from Airbus in Toulouse on May 25, with the aircraft named in honour of former Airbus CEO and outgoing EADS CEO Louis Gallois. 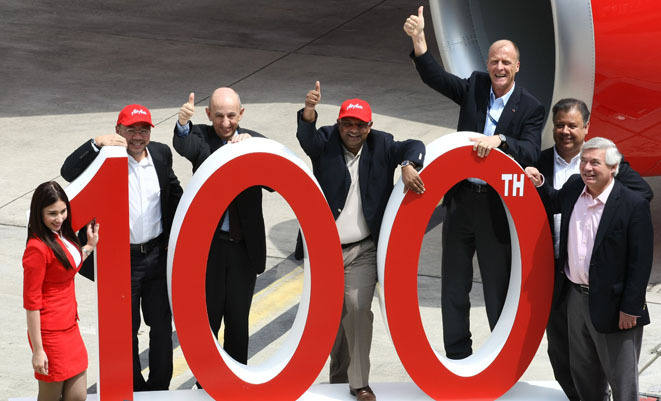 AirAsia has 375 A320/A320neos on order, which when delivered will make it the largest operator of Airbus aircraft in the world.